If you have a team of reviewers that will be added as users within your account in order to review large set of document, Lexbe eDiscovery Platform or Admin Users can set up coding fields based on protocols, as per the customer's request. The coding fields would be set up from the Manage Custom Doc Fields page and would be displayed under the Document Viewer>Discovery Tab. >Take the number of documents and divide the pages between the reviewers. For example, if a case has 278,227 documents displayed in 11,130 pages in the Browse screen with 25 documents per page (~ 11,130 x 25). You can divide up these pages between the reviewers. For example if 10 reviewers each might have 1,113 pages (11,130/10). >Works well if document count is not changing. 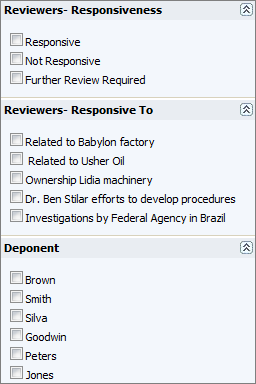 >Assign batches of documents to reviewers (e.g., 2,783 per each of 10 reviewers). You can do this yourself with Multi Doc Edit , but better that we do it for you with such large case. >Each coder than filters on his/her initials and sees and codes only their documents. >Advantages: Ability for each coder to filter on their set and search with that filter. Ability to reassign documents from some users to others. >Disadvantages: More cumbersome to set up and maintain. >Each coder receives one or more fields to review and they go through all documents and code that field only. >Advantages: Some people prefer single-focus of approach. >Disadvantages: Inefficient with large numbers of fields to review. Document load time becomes more of an issue with this approach and can be slow with large document sets. Not recommended here.